Broadcasters in Eastern Europe have pre-bought a forthcoming Christmas special commissioned by Irish public broadcaster RTÉjr. 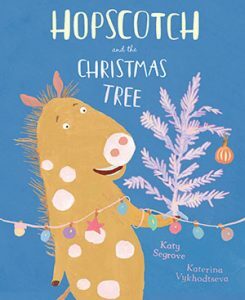 Hopscotch & the Christmas Tree (1×30′) has been sold to Czech TV in the Czech Republic and HRT in Croatia by London-based Meta Media. This follows previously reported sales to US Hispanic broadcaster V-Me, YLE in Finland, RTV in Slovakia, ERR in Estonia, LTV in Latvia and LRT in Lithuania. The toon tells the story of a happy horse and her animal friends and aims to teach children they can solve problems by staying positive. It is based on a book of the same name by author Katy Segrove and illustrator Katerina Vykhodtseva. The book was first published in the UK last year by Tiny Tree. The special is coproduced by Kino Mind Films, which has a prescence in Lithuania, the UK and Canada, and Ink & Light, which is based in Finland and Ireland. It is due to air during the festive period this year and is produced with backing from Screen Ireland and the Lithuanian Film Centre. A TV series, titled Happy Go Hopscotch, is in development and is set to air in late 2020 or early 2021. French distributor KMBO Films holds theatrical, TV and VoD rights to the special in French-speaking Europe.